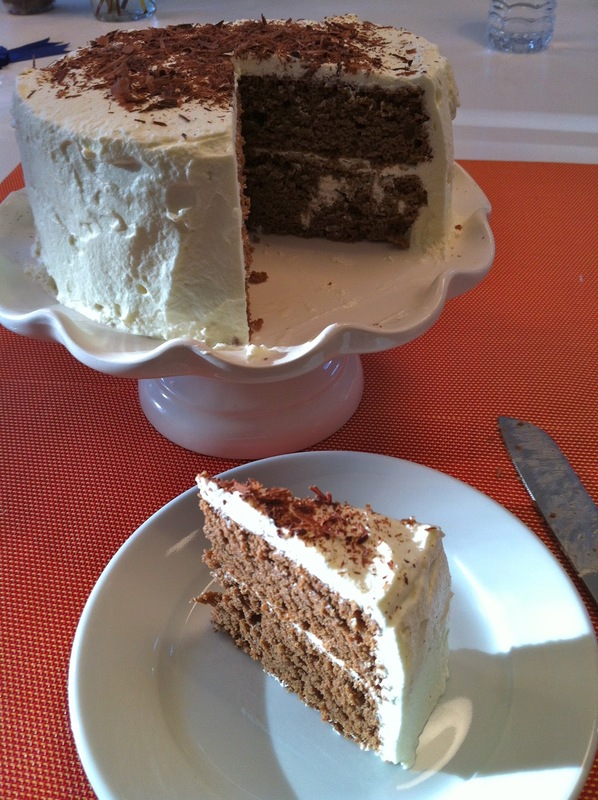 celebrating with chocolate chiffon cake | what is clara eating today? today was the second year anniversary for clara’s seizure-free day! I wanted to make something extra special for her, so i modified my favorite chocolate chiffon cake recipe to make it work for both clara and ellen (nut allergy)… enjoy this nut-free, low carb, unbelievably yummy cake! Lightly whip the egg yolk. Add Truvia (39g) and beat for about 5 minutes. Add water and olive oil in order as you beat well. In a separate bowl, mix together coconut flour, cocoa powder, baking powder. Sift three times. In a separate bowl, make meringue by whipping egg white as you slowly add Truvia (39g). Whip until stiff peak forms. In two lightly greased 6 inch round cake pans, pour in the batter evenly divided. In preheated oven (300F), bake for 35-40 minutes. Immediately take out of the pan and cool on wire rack. When the cakes are completely cooled, it is ready for icing, or can wrap it in plastic wrap and store in freezer for later use. For icing whip the heavy whipping cream, Truvia(13g), and orange flavor. place one cake on a plate. Spread little bit of cream on top (1/8 inch thick), then stack the second cake. Cover the cake with rest of the cream. approximately 2g of carb per slicebest eaten within 1-2 days. after 1-2 days, left over slices can be individually wrapped and kept in freezer. Posted in desserts, special day? I made this and it doesn’t look at all like yours. Each of my layers were less than an inch thick and in your photo the layers look thick and fluffy. Did I do something wrong? Pingback: Got Cake? How about Chocolate Chiffon?! | Keto Joy!